FLIXTON, a township and a parish in Barton-upon-Irwell district, Lancashire. The township lies in the peninsula between the rivers Irwell and Mersey, 3½ miles SSE of Barton-Moss r. station, and 7 WSW of Manchester; and has a post office under Manchester. Acres, 1,575. Real property, £6,966. Pop., 1,302. Houses, 251. The parish includes also the township of Urmston. Acres, 2,549. Real property, £11,477. Pop., 2,050. Houses, 409. The property is subdivided. Flixton Hall is the seat of the Wright family. The living is a rectory in the diocese of Manchester. Value, £300. * Patron, the Bishop of Manchester. The church is good; and there were placed in it, in 1859, two memorial windows of Mr Thomas Rogers and of the Wright family. The vicarage of Urmston is a separate charge, constituted in 1868. There are two Wesleyan chapels, and charities £11. Local studies information is held at Trafford Local studies library. Details about the census records, and indexes for Flixton. You can also perform a more selective search for churches in the Flixton area or see them printed on a map. The Register Office covering the Flixton area is Trafford. Ask for a calculation of the distance from Flixton to another place. "FLIXTON, a parish in the hundred of Salford, county palatine Lancaster, 7 miles S.W. of Manchester, its post town. It is bounded on the N. and W. by the river Irwell, and S. by the Mersey, and includes the hamlet of Urmston. The surface is generally level, and the soil in some parts inclines to a peaty moss. Clover is extensively cultivated. The village is considerable, and contains some good residences of the Manchester merchants. The living is a perpetual curacy in the diocese of Manchester, value £150, in the patronage of the bishop. The church is dedicated to St. Michael. The Wesleyans have a chapel here. There is a school with an endowment of £10 per annum." In 1835 the parish of Flixton contained the townships of Flixton and Urmston. Information about boundaries and administrative areas is available from A Vision of Britain through time. 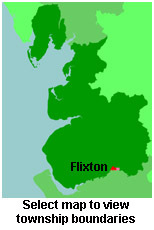 You can see the administrative areas in which Flixton has been placed at times in the past. Select one to see a link to a map of that particular area. A description of Flixton in the 19th century. View maps of Flixton and places within its boundaries. For probate purposes prior to 1858, Flixton was in the Archdeaconry of Chester, in the Diocese of Chester. The original Lancashire wills for the Archdeaconry of Chester are held at the Lancashire Record Office.